Royal Mail have at last formaly told us what will be available from Post and Go machines at Stampex. 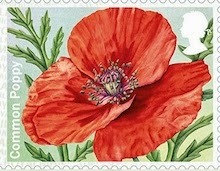 *We know from the Philatelic Bulletin that the solo Poppy Post and Go stamp will be available from Post and Go Kiosks from 21 October. additional caption from machines A004 and A005. § Pre-orders: from past experience it is likely that stamps from the B machine will not be available on demand at Royal Mail's Stampex counter. There is a minimum order level of £150 for pre-orders; ask for details. As far as I know, nobody has mentioned an Overprint on the Jersey Flag and the site doesn't indicate what it reads. This will be sold for 12 months subject to availability. Will the Jersey Post & Go terminal be dispensing the International air display overprint on there Jersey Flag, or will these only be available from the Broad Street machine in Jersey ? No information has been provided and in the absence of such I would expect the Air Display to be available in Broad Street only. It's not relevant anywhere else. Thank you for mentioning this. I got an email a few weeks ago, but forgot to include that information here. Oyster cards are the best way, of course. I've been reminded that the older collector, ie many of us, also possess Concessionary Bus passes issued by the Local Authority and these are available on London buses, but not on the Underground. Presumably the Jersey Flag stamps are not valid for postage in England. How does one get a FDC postmark on a cover with the overprinted Jersey Flag stamps produced at Stampex?